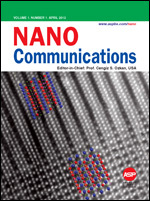 NANO COMMUNICATIONS is an international journal that provides a forum to publish peer-reviewed research articles on all aspects of nanoscale science, engineering and technology dealing with materials synthesis, processing, nanofabrication, nanoprobes, spectroscopic characterization, properties and applications of functional materials and devices. The journal publishes original rapid communications on new scientific findings dealing with nanoscience and nanotechnology connected with all disciplines of science, engineering and medicine. The review articles (with author's photo and biography) focused on timely research topics are also considered for publication.